The term “griddle” has become pretty far-reaching these days. In fact, Cuisinart makes three different product lines that could all reasonably be called griddles. First off is the old-fashioned griddle pan that resembles a square skillet. It is meant to sit on your stovetop and shares the characteristics of any skillet. 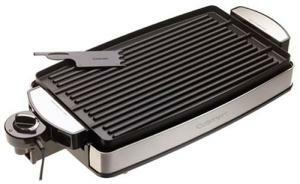 Second is the open-faced electric griddle, which brings a power source to the job, convenient when stovetop space is a premium. Finally, there’s the Griddler — a relatively new phenomenon that’s inspired by the George Foreman grill craze. It is more of a “contact grill,” with a cover for pressing paninis and other sandwiches. Cuisinart brings their typical approach to all three, producing great products that are well-built and provides a significant warranty to back them up. It's getting easier and easier to "go green." Companies that make toilet paper, cars, cleaning products, and clothes are all jumping on the eco-friendly band wagon. So why not kitchenware?